U.S. government trade figures for January 2017 indicated raw material imports were up in all three categories outlined: hog bristle, broom and mop handles and metal handles, compared to January 2016. Import totals for January 2017 were up in four finished goods categories outlined: toothbrushes, hairbrushes, paint rollers and paintbrushes, compared to January 2016. The United States imported 32,782 kilograms of hog bristle in January 2017, up 133 percent from 14,088 kilograms imported in January 2016. China sent all of the hog bristle to the United States during January 2017. The average price per kilogram for January 2017 was $29.40, up 4 percent from the average price per kilogram for January 2016 of $28.22. The import total of broom and mop handles during January 2017 was 1.9 million, up 73 percent from 1.1 million for January 2016. During January 2017, the United States received 665,491 broom and mop handles from Brazil and 559,060 from Honduras. The average price per handle for January 2017 was 70 cents, down 25 percent from the average for January 2016 of 93 cents. January 2017 imports of brush backs totaled 588,613, up 12 percent from 526,710 for January 2016. The United States imported 541,303 brooms of broom corn valued at more than 96 cents per broom during January 2017, down 3 percent from 556,935 for January 2016. The average price per broom for January 2017 was $2.39, down 5 percent from $2.52 for January 2016. The import total of brooms and brushes of vegetable material during January 2017 was 111,370, down 52 percent from 232,045 brooms and brushes imported during January 2016. 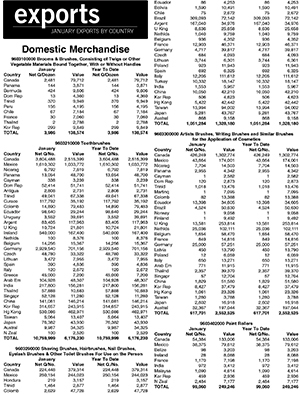 Sri Lanka exported 68,782 brooms and brushes to the United States during January 2017, while Vietnam sent 36,520. The average price per unit for January 2017 was $1.32, down 1 cent from the average price for January 2016. The United States imported 104.5 million toothbrushes in January 2017, up 2 percent from 102.2 million imported in January 2016. China sent 83.4 million toothbrushes to the United States during January 2017. The average price per toothbrush for January 2017 was 18 cents, down 10 percent from the average price for January 2016 of 20 cents. January 2017 imports of hairbrushes totaled 4.2 million, up 17 percent from 3.6 million for January 2016. China shipped nearly all of the hairbrushes to the United States during January 2017. The average price per hairbrush was 23 cents during January 2017, down 15 percent from 27 cents for January 2016. The United States imported 8.3 million shaving brushes in January 2017, down 3 percent from 8.6 million imported in January 2016. China sent 6.1 million shaving brushes to the United States during January 2017, while Italy shipped 986,864. The average price per shaving brush for January 2017 was 10 cents, down 50 percent from the average price for January 2016 of 20 cents. The import total of paint rollers during January 2017 was 8.1 million, up 42 percent from 5.7 million for January 2016. China sent 7.1 million paint rollers to the United States during January 2017. The average price per paint roller for January 2017 was 35 cents, down 27 percent from the average price for January 2016 of 48 cents. U.S. companies imported 25.4 million paintbrushes during January 2017, up 37 percent from 18.6 million for January 2016. China shipped 24 million paintbrushes to the United States during January 2017. The average price per paintbrush for January 2017 was 29 cents, up 7 percent from 27 cents for January 2016. The total import of upright brooms for January 2017 was 1.5 million, down 17 percent from 1.8 million for January 2016. China sent 1.3 million upright brooms to the United States during January 2017. The average price per broom for January 2017 was $1.37, down 1 cent from the average price for January 2016. Export totals for January 2017 were down in three categories outlined: brooms and brushes of vegetable materials, toothbrushes and artist brushes, compared to January 2016. The United States exported 3,986 dozen brooms and brushes of vegetable materials during January 2017, down 27 percent from the January 2016 total of 5,428 dozen. The United States sent 2,481 dozen brooms and brushes to Canada during January 2017. The average price per dozen brooms and brushes was $34.77 in January 2017, down 25 percent from $46.08 for January 2016. During January 2017, the United States exported 10.8 million toothbrushes, down 41 percent from the total recorded in January 2016 of 18.2 million. The average price per toothbrush for January 2017 was 57 cents, up 68 percent from 34 cents for January 2016. The United States exported 1.1 million shaving brushes during January 2017, the same as for January 2016. Brazil imported 309,093 shaving brushes from the United States during January 2017, while Mexico received 250,154 and Canada imported 224,448. The average price per shaving brush for January 2017 was $1.26, up 25 percent from $1.01 for January 2016. January 2017 exports of artist brushes totaled 617,701, down 29 percent from 869,831 for January 2016. Canada received 426,249 artist brushes from the United States during January 2017. The average price per artist brush was $4.13 during January 2017, up 54 percent from the average price for January 2016 of $2.68. Canada imported 64,907 paintbrushes from the United States during January 2017, while the United Kingdom received 41,940. The average price per paintbrush for January 2017 was $6.93, down 41 percent from $11.81 for January 2016. Click here for the entire January 2017 Import/Export Statistics. new board of directors. The new board convened for its first meeting March 31.
business units,” according to a press release. Daniel B. Hatzenbuehler, Josie Hale Nielson and Richard Ayers. • Daniel B. Hatzenbuehler, most recently chairman of the board of E. Ritter & Company. He was previously CEO of the family-owned agricultural and communications company, with operations in Arkansas and Tennessee. partnership between two brothers and today is led by a third generation family member and Senior Leadership team committed to the same high standards as the founder. 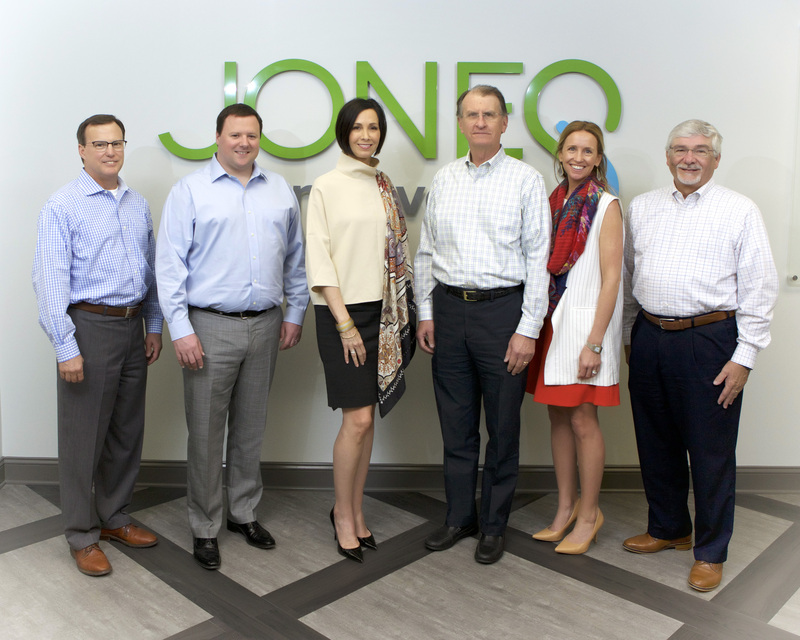 The company has two distinct divisions: Jones Yarn and Jones Nonwovens,” said the press release. 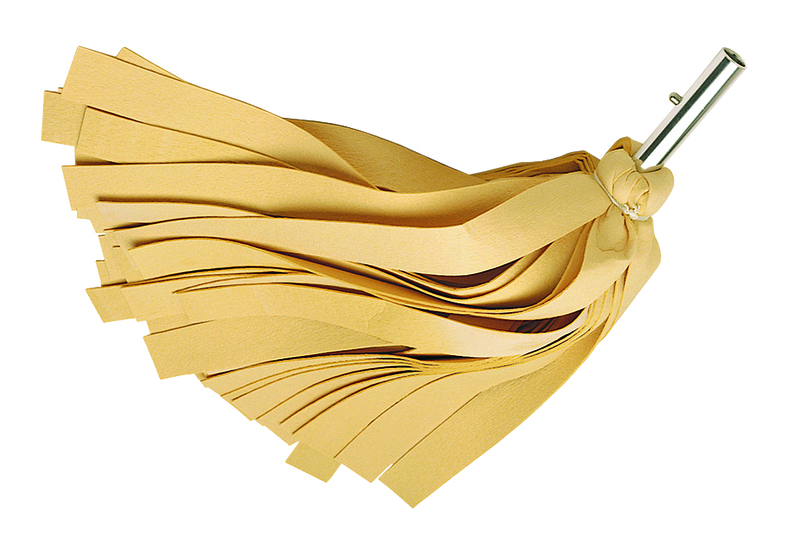 Manufacturers Association (ABMA) and National Broom & Mop Association." Visit www.jonesfamilyco.com or view the company story on YouTube. steady, flashing, or off; rugged, heavy-duty construction that provides long life; fold-flat design provides convenient storage and is easily transported; and, is 25-inches high and two-sided. Contact customerservice@ocedarcommercial.com for more information. Nexstep Commercial Products is the exclusive licensee of O-Cedar. 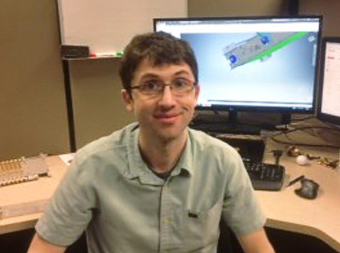 Abtex Corp. has hired Josh Prescott as design engineer. Prescott has more than a decade of experience in product design and development for technology companies. Most recently, he served as project manager and lead mechanical engineer for HSTAR Technologies of Cambridge, MA. Prescott holds a master’s degree in mechanical engineering from Boston University, and bachelor’s degree in assistive and universal design from Hampshire College. “Since 1980, Abtex Corp. has been providing integrated brush/machine deburring solutions to the North American manufacturing industry. The company supplies filament brushes and custom-designed deburring machines for a wide variety of machined-part, aluminum-extrusion, fine-blanked, and powdered-metal applications. Customers include manufacturers such as automotive tier 2 and tier 3 parts producers,” said the company. Visit www.abtex.com for more information. May 23-25 at the Pulire Expo in Verona, Italy. “The event showcases products like the latest technologies, solutions, systems, equipment and services in a variety of industries including environmental management and technology,” said the company. By Malish products, a diamond abrasive floor preparation system. Malish will also be promoting its OEM services. 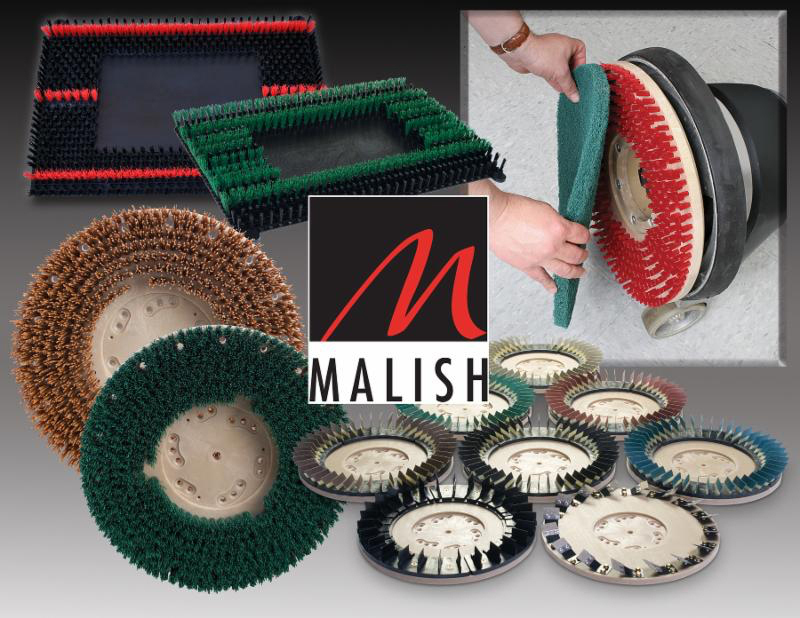 Founded in 1945, The Malish Corporation specializes in the manufacturing of rotary or disc brushes, janitorial brushes, foodservice brushes and the Diamabrush™ By Malish Floor Preparation System. The company is also a custom extruder of thermoplastic tubes and profiles. It is headquartered in Mentor, OH. Visit www.malish.com for more information. 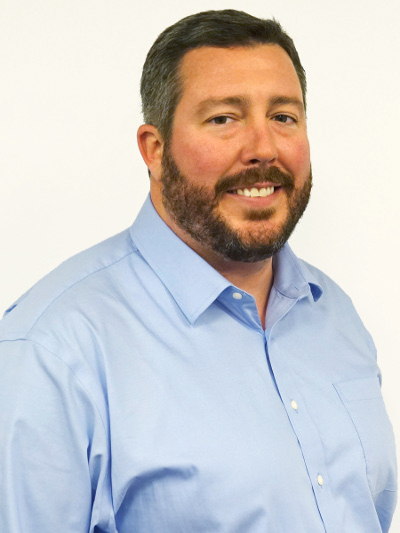 Weiler Abrasives Group, a provider of abrasives, power brushes and maintenance products for surface conditioning, has named Chad McDonald as its new vice president of sales, U.S. and Canada. 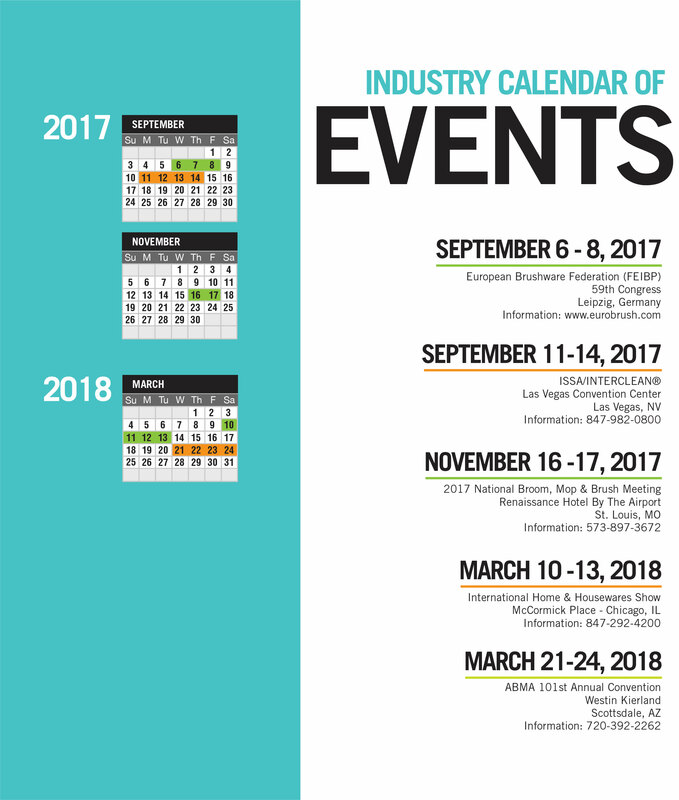 McDonald oversees all sales activities in the U.S. and Canada, including field sales, national accounts and manufacturer’s rep groups. He is responsible for continuing to strengthen Weiler’s relationships with distribution partners, end-users and industry associations. “McDonald most recently served as director of sales for the power tool division at APEX Tool Group, and comes to Weiler with more than 18 years of sales and marketing experience representing a mix of companies, products and industries. He brings expertise in sales leadership, key account management, product commercialization and program development, among other key areas,” said the company. Prior to his time at APEX Tool Group, McDonald was the business unit director for KaVo Dental, a Danaher business, where he led both the sales and marketing teams in the U.S. He has also held various sales and marketing roles with Danaher Tool Group and IRWIN Industrial Tools. McDonald holds a bachelor’s degree in marketing from Georgia Southern University, and an MBA from Loyola University Maryland. Visit www.weilercorp.com for more information. like a sponge, allowing for a quick, spot-free dry,” said Shurhold. not mold, mildew or build-up bacteria. 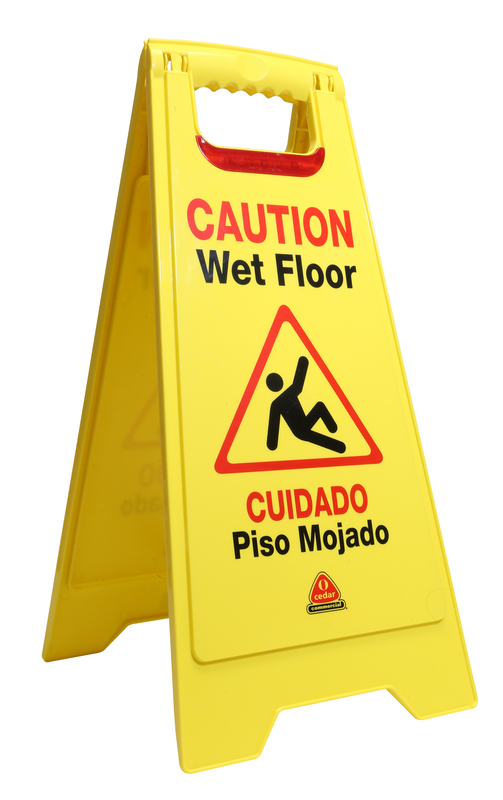 The mop features a rigid construction to assist drying vertical surfaces, and a rubberized internal guard protects from accidental scratching. excess water is simply wrung out,” according to the company. Visit www.shurhold.com/auto for more information.